A biotin deficiency can only be induced if the reptiles' diet consists of 100 percent raw eggs. Even though this seems very unlikely, cases have been reported in species like Monitors (Varanus sp.) 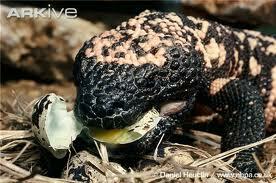 and Gila Monsters which enjoy raw eggs in the wild and have been fed a diet consisting of exclusively raw eggs in captivity. Although the egg yolk contains high levels of B vitamins, the raw egg white contains the anti-nutritive factor avidin, which binds to biotin, making it unavailable to the body. In the wild, most eggs consumed by reptiles are already fertile or have been incubated for a period of time, which in turn decreases the avidin content. However, unfertilised hens eggs are high in avidin, these are the eggs which are fed in captivity. Furthermore, these oviphagous reptiles would likely eat other items in addition to eggs. Clinical signs usually manifest themselves as skin lesions, muscular weakness, tremors and anorexia. A change in the diet with the inclusion of raw meat and small mammals and vitamin supplementation is usually enough to reverse the damage. It is recommended to feed a minimal level of raw eggs to such reptiles.